Our bureaucrats cannot be trusted: what you need to know, and do. BY THIS TIME NEXT YEAR, you will not only have lost your lever action shotgun, but been forced to install an expensive alarm system for your hunting rifle and surrender your 10 round magazines for 5 rounds. In this article, we tell you what the government is up to – and what you and your shooting mates /clubs can do about it. We’re getting worrying reports about what our bureaucrats in Canberra have in store for us, as our Police Ministers meet next month. Field and Game Australia has similar concerns, asking shooters to send letters to their local MPs. Click here to read their call to arms. Sporting Shooters Association of Australia (Vic) added their voice. See what they said by clicking here. Firearm Dealers Association of Queensland President, Robbie Nioa, one of Australia’s largest dealers, has echoed similar concerns. See his statement by clicking here. neither industry nor recreational organisations have been consulted. Their concerns are the direct result of their lobbying efforts in Canberra. Even if there is a degree of coordination in messaging, that’s a good thing. If the government has nothing to hide, it wouldn’t do this. Our public servants and regulators are up to something, and will try to force or sneak whatever it is through next month’s Police Minister’s meeting. Time to get rolling. Again. Last year you proved how effective mobilising you and your friends can be on the Alder issue. It resulted in the Nationals applying enough pressure to force Justice Minister, Michael Keenan, to announce a stay of execution on the lever-action shotguns earlier this year. However, this was done just weeks before the federal election. Now that the election is behind us, his office and bureaucracy are showing us how contemptuous they are. We need to show how determined we are: they need to pay the price for treating us with contempt. If anything, we need to get pump-action shotguns back, and some semi-autos as well – but let’s put that aside for the moment and win this fight first. With state police trying to sneak some of our Category A firearms into Category D based on ‘appearance’, it’s clear from what happened in Tasmania that their police service didn’t know what they were doing (click here to see our previous post on what they did). There is plenty of evidence to support this concern. The Victoria Police have been backgrounding the Herald Sun on this issue for the last couple of years. They say they could open our safes ‘with their teeth’ and want storage requirements tightened. The solution? Simple. Force gun owners to get monitored back-to-base alarms. If this happened, it would cost you over $1,000 to install and at least $40 a month. Yet the police don’t routinely attend house alarm calls – so nothing would happen! Apparently 10 shot magazines scare people. The bureaucrats who advise on firearms policy are vegan eating hipsters who cycle to work. They wouldn’t know an Anschutz from a Remington, or how to handle a firearm – yet they are the ones telling their Ministers why you should be limited to 5 shot mags. Or maybe no mag at all. Your club: If you’re a member of a club or association which is not a member of the CFCV (click here to see who our members are), send them this blog so they know what’s going on. Ask them to forward this to their members asap so they can join us in stopping this from happening. Write: Get on the email and phone now. 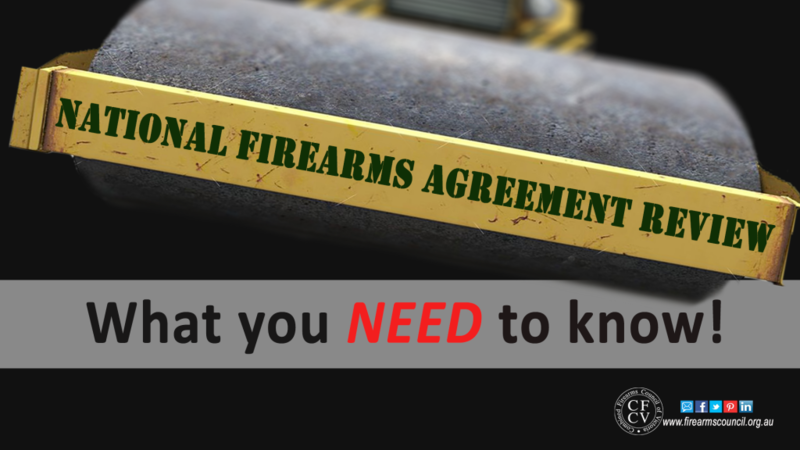 Let your local politician know that you don’t support any change to the NFA. There are two emails (or letters) you need to write. The first is to your local & federal MPs and copy it to your Premier (in Victoria, [email protected]) and Police Minister (in Victoria, [email protected]). Find your local MP (and your local Police Minister if interstate) by clicking here. In Victoria you can find your local MP here. If you send us links for interstate MPs, I’d be happy to add them to this list. I understand the Police Ministers will meet in October to consider proposals relating to the National Firearms Agreement, in particular the categorisation of some firearms, storage requirements and magazine capacity. These proposals have been developed under a shroud of secrecy to avoid consultation with the shooting community. This is divisive and can only lead to bad policy outcomes. Good policy outcomes come through proper consultation processes which support a “no surprises” approach. However, state and federal public servants and the police have been developing policy proposals ‘under the radar’ which demonstrates bad faith on their part. Policy development without consultation leads to significant errors. Earlier this year the Tasmania Police published guidelines (without consultation) which inadvertently advocated a ban on the Olympic target sports: they later withdrew their guidelines. Last year the Victoria Police issued guidelines (without consultation) on the transportation of firearms which misinterpreted the Firearms Act: these required significant correction, to their embarrassment. Behaviour like this is inexcusable and helps no-one. It certainly does not help make your job, or that of our relevant ministers, easier. As a constituent directly affected by the National Firearms Agreement, I would like to suggest that the full suite of proposed changes to the NFA be referred to state and commonwealth firearms consultative committees for proper and open consultation with the shooting community. I believe the Police Ministers should consider implementing a new and permanent model of policy development which takes facts and data into account, and supports the “no surprises” approach. The “gotcha” approach we have now is a disgrace. It’ll take you just five minutes to send this email (or letter). It’ll enable you to do your bit to help save your fellow shooters from a whole lot of new pain. Don’t let your shooting mates off the hook. Tell them that if they don’t get off their bums, they could lose their favourite 308 – or whatever it is they keep bragging to you about. Tell them they could also lose their magazines, pay more for storage in their own homes if they don’t have their say. Make sure they do it, otherwise they’ll forget about it. Tell them to do it today – and hassle them if they haven’t done it within the next couple of days. We’re really angry about this and know you are as well. Recently we ran a poll on Facebook which said 78% of you don’t trust the government on this, and they’ll try to ban our lever action shotguns. 66% of you said they’ll also try something with our lever-action rifles. Stay up to date on what’s happening with the review. Follow us on Facebook or click here to join our email list. Great to hear! It’ll be interesting to see what the response says. Or doesn’t say. sent a few emails out.. I will not take this sitting down!